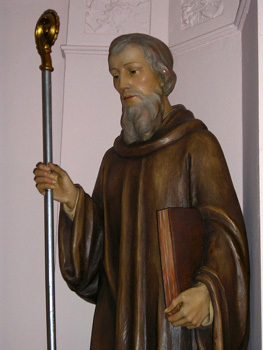 St. Benedict was born in Nursia, Italy around the year 480. He was born into a world where the Roman Empire was collapsing and waves of invaders were weakening the country. Italy was a war torn, disease-and-hunger plagued land. Benedict was sent as a teen to Rome by his parents to acquire a liberal education. He found many of the students abandoning themselves to vice and turned his back on the ‘world’ to go into solitude. He eventually made his way to Subiaco where he lived in solitude in a cave for 3 years. He became known as a wise and holy man and men started to gather around him to devote themselves to God’s service. He eventually established 12 monasteries there with an abbot and 12 monks in each. Benedict left Subiaco after some years and established a monastery at Monte Cassino, Italy. It was here that he wrote his famous Rule and here he died around 547. He was known as a great miracle worker during his time and is considered the founder of western monasticism. Since the 6th century, thousands of monasteries have sprung up which follow the Rule of St. Benedict.. Men’s and women’s religious communities that follow his Rule can be found on every continent (except Antartica!) to this day.